This article is about Giga Bowser in general and his appearance in Melee. For his regular appearance, see Bowser. For his appearance as Bowser's Final Smash, see Giga Bowser (Final Smash). Not to be confused with Giant Bowser. Mario squares off against Giga Bowser in the Adventure Mode. Giga Bowser (ギガクッパ, Giga Koopa), is the gargantuan and powered-up version of Bowser. He first appeared as a hidden final boss in Super Smash Bros. Melee's Adventure Mode and as one of the final opponents the player must face in Event Mode. He eventually made his semi-playable debut in Super Smash Bros. Brawl as Bowser's Final Smash. Having debuted in the Super Smash Bros. series, Giga Bowser is considered a part of the Super Smash Bros. universe, even though the character he is based on, Bowser, is from the Mario universe. In Melee, Giga Bowser appears as a hidden final boss. To encounter him, all previous stages in the mode have to be completed in under 18 minutes and on Normal difficulty or higher and without using a Continue. If done correctly, a new cutscene will be shown after Giant Bowser is defeated - his KO'd trophy will return to the stage and be struck by lightning, causing it to come back to life as Giga Bowser. Defeating Giga Bowser leads to the completion of the Adventure Mode; defeating him without using a Continue also rewards the player with his trophy. Giga Bowser also appears in Melee's final Event Match, alongside Ganondorf and Mewtwo. The match is similar to his appearance in the Adventure Mode, but with the presence of two teammates. Clearing the Event Match allows the player to use Final Destination as a Versus stage, as well as rewarding Final Destination's trophy; as an added bonus, clearing the match without losing a stock rewards the player with an exclusive Notice. Unlike most other bosses, Giga Bowser has a damage percentage as opposed to HP (in both of his appearances) and takes knockback; the player must KO him by knocking him offstage as opposed to merely attacking him. Although winning with Giga Bowser usually crashes the game, he can sometimes "appear" on the Results screen. If the game is hacked through the use of the debug menu, it is possible to use Giga Bowser as a character. Giga Bowser is mostly functional, and his name is even displayed on the Jumbotron in Pokémon Stadium (as "G-Bowser"). Internally, Giga Bowser is known as GKOOPS. Due to a lack of victory poses to display for him on the results screen, the game will usually crash if Giga Bowser wins a match, due to a panic event being called. When the game is played on the Dolphin emulator and panic events are deliberately suppressed, when Giga Bowser wins a match, the game will not freeze, and the results screen will appear. The game, however, will display Sheik's name in red, and Giga Bowser's stock icon will be a Target. The announcer, however, will properly say Giga Bowser's name. Giga Bowser makes his debut as a semi-playable character in the Smash series as part of Bowser's Final Smash. When the Final Smash is activated, Bowser transforms into Giga Bowser, allowing players to take advantage of his increased power and range, as well as different hitbox properties. While Giga Bowser does not flinch during this transformation, the transformation only lasts ten seconds. Outside of this appearance, as well as his related trophy, Giga Bowser does not make any other appearances in Brawl, and SSB4. In Ultimate, due to full-moveset transformation Final Smashes being removed, Giga Bowser forgoes having a full moveset, instead acting akin to the Dragoon, where he teleports to the background and allows the player to aim a punch. The punch deals 40% damage, and causes an instant Screen KO for opponent(s) at 60% damage or greater. Giga Bowser as he appears as a boss in Super Smash Bros. Ultimate. Giga Bowser appears as a boss in Classic Mode for Mario and Captain Falcon. In the final stage, Bowser initially appears instead of a boss; once he is KO'd, a cutscene plays where he transforms into Giga Bowser, similarly to the final stage of Melee's Adventure Mode at high difficulties. A Maxim Tomato appears for recovery as the battle begins. Unlike Melee, Giga Bowser does not flinch from attacks, and the player must deplete his HP to defeat him, as opposed to being launched off the screen, just like every other boss. Following Smash 4, he utilizes Bowser's moveset from Brawl. Additionally, he moves slower as his attacks now have much more startup lag. In World of Light, Giga Bowser is first fought in the Molten Fortress sub-area of the Light Realm map, and then fought again during the Final Battle like every other boss. The player faces him on the Final Destination stage, while the Giga Bowser theme is playing. Unlike other boss battles, defeating him will release the regular Bowser from Galeem's control, instead of both appearing separately on the map (as is the case with Ganondorf and Ganon). He's fought for a second time during the true final battle with Galeem and Dharkon. During the battle's second phase, Giga Bowser is the second Light Realm boss to appear on screen, which might indicate him being the second boss in the game. Much like in Melee, Giga Bowser can only be played via hacking or modding. However, most of his moves have several restrictions, including the loss of infinite super armor (albeit still having a good deal of), dashing, dash attack, down tilt, neutral aerial, and down aerial. However, despite these changes, Giga Bowser retains Bowser's more primeval moveset from Brawl. But unlike in his previous appearances, many attacks are generally much slower as his moveset gained a significant amount of start up lag, ending lag, and landing lag, as well as his jumpsquat being the slowest to jump out of. These changes are likely to help balance him as a boss character. Undoubtedly the most dramatic transformation between Bowser and Giga Bowser is the clear difference between their sizes; Giga Bowser is almost twice as large as Bowser, and even if Bowser is under the influence of a Super Mushroom, Giga Bowser is still slightly larger than him. This larger frame also leads to Giga Bowser being considerably heavier than Bowser, and when fought in Adventure Mode, he is also given a handicap to make him even more difficult to KO. Adding to this, Giga Bowser also has access to some super armor, making him unable to flinch from some attacks. Just like Master Hand and Crazy Hand, Giga Bowser cannot be grabbed, inhaled by Kirby, nor egg laid by Yoshi; severely limiting combo options. As a transformation of Bowser, Giga Bowser's moveset is identical to his. His attributes, however, are significantly altered. His attacks are considerably stronger in power and knockback. Some of Giga Bowser's attacks also have different properties as a result of his transformation; Fire Breath, for instance, does not run out or become weaker the longer it is used, as well as having a longer range (in Ultimate, it can carpet the entire surface of Final Destination, however unlike his past appearances, his fire runs out after a period of time.). In addition, many of Giga Bowser's attacks are given unusual hitbox properties: his claw-based attacks (side tilt, up tilt, down tilt, edge attacks, forward aerial, forward throw, and back throw) all have a darkness hitbox; his shell-based attacks (his up smash, neutral aerial, back aerial, down aerial, and up throw) all have electric hitboxes; his horn-based attacks (his forward smash and pummel) have explosion effects; and his down smash has freezing properties, as does Whirling Fortress when used on the ground. In order to compensate for Bowser's ordinary sub-par recovery, Giga Bowser's Whirling Fortress grants significantly more height, and it also has 26 invincibility frames; its large hitboxes also give multiple pseudo-invincibility frames. 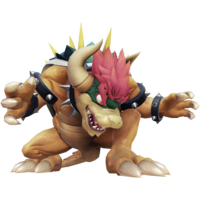 Unusually, if Giga Bowser captures an opponent with Koopa Klaw, he can bite his opponent, but no damage will be inflicted unless the opponent is as big as Donkey Kong or Bowser or powered up with a Super Mushroom. In addition to this error, Giga Bowser's fastfalling speed is identical to his ordinary falling speed. Visually, Giga Bowser has more pronounced physical features than the normal Bowser; aside from the aforementioned size, Giga Bowser has longer and less-bulky limbs with more toned muscular regions, sharper fangs, claws and shell spikes, a less rounded snout, larger horns, spikier hair, a more realistic shell, larger feet, bloodshot eyes, and a darker overall skin tone. An even more imposing figure than the original King of the Koopas, Giga Bowser is roughly twice the size of his scaly, fire-breathing, spike-studded, Super Smash Bros. Melee counterpart. Predictably, this monstrous creature's offensive and defensive powers are a grade higher than those of regular Bowser. Good luck defeating this colossus! Left: Giant Bowser and normal Giga Bowser. Right: Normal Bowser and Tiny Giga Bowser. As previously mentioned, in Melee there exists an unused sound clip where the Announcer says Giga Bowser's name. This clip can only normally be heard in the Sound Test. As expected, due to Giga Bowser's different names in English and Japanese, there exist two different sound bites, one where the announcer says "Giga Bowser!" and the other "Giga Koopa!". In the NTSC version, the two clips are oddly swapped in the Sound Test; the announcer says "Giga Koopa!" when the game language is set to English and "Giga Bowser!" when the game language is set to Japanese. The PAL version only has the "Giga Bowser!" clip, as expected. Both are used properly if Giga Bowser is hacked to be available on the character select screen, or if he wins a match without the game crashing. The size difference between Bowser and Giga Bowser is approximately equal to one usage of a Super Mushroom or Poison Mushroom, with Giga Bowser being slightly larger when he is shrunk or Bowser is enlarged. Despite this, the two characters' weights do not share the same ratio as the code for changing characters' sizes does, so Giga Bowser will actually be lighter than Bowser in both cases. Giga Bowser was at one point under consideration to be a transformation of Bowser in the Skylanders game Skylanders: SuperChargers. However, he was replaced by the Skylanders-original Molten Bowser. 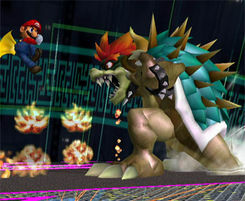 Giga Bowser in Melee, as well as Super Smash Bros.'s Metal Mario and Giant Donkey Kong, are the only boss characters in the Super Smash Bros. series to have their own character data and still use the standard percentage-based damage meter as opposed to a health bar. Every other boss in Melee to use the standard percentage meter (and every boss that does this from Brawl onward aside from the final form of Master Core) is simply a regular character with a modifier attached, while the aforementioned three bosses are actually coded as separate characters. Giga Bowser's design closely resembles that of Ganon's in The Legend of Zelda: Ocarina of Time, due to them being hulking, monstrous-looking bipedal creatures that sport a mostly green coloration, and similar horns, hair, and tails. The resemblance between the two is best seen in Ultimate, due to Ganondorf reverting back to his Ocarina of Time design, last seen in Melee, in this game. Giga Bowser was created due to Masahiro Sakurai's interpretation of Bowser's 8-bit sprites as a "frenzied, terrifying monster", compared to his modern appearance, which has steadily become cuter. He also notes that Giga Bowser and Bowser are separate characters, though this is contradicted with later installments. This page was last edited on April 20, 2019, at 09:36.